To begin, one can consider impacts of climate change on average global yields of major commodities. A recent study by Tebaldi and Lobell (2008) attempted to estimate the probability distribution function (pdf) of impacts for maize, wheat and barley - three crops for which the relationships between average yields and crop-area weighted temperature and precipitation are relatively strong. 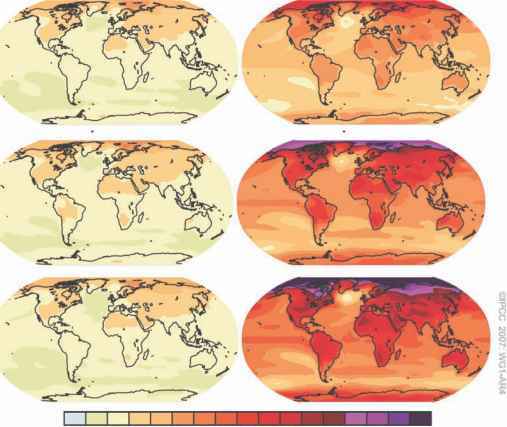 The authors computed a pdf for temperature and precipitation changes, based on a Bayesian analysis of 18 climate models. The median warming by 2030 (2020-2039 average) relative to 1990 (19801999) was 1.6°C for maize, 1.4°C for wheat and 1.2°C for barley, with the slight differences due to the geographic distributions of the crops. The estimated 5th percentile for temperature, representing the level at which there is only a 5% chance of warming by less than this amount, was 0.9°C, 0.7°C and 0.5°C, respectively, for the three crops (see Table 3.2). The warm end of the projections, or the 95th percentile, was 2.3°C, 2.0°C and 2.0°C. Corresponding values for precipitation are also shown in Table 3.2. Importantly, this study considered only average yields over a 20-year period, and not the occurrence of particularly bad years. The latter could change by more or less than the average, depending on whether and how inter-annual variability changes (see the 'Other factors' section). Also, these impacts consider only changes and effects of growing season average conditions, and so would miss any impacts of extreme events such as floods or extreme dry spells. At the same time, the impacts do not consider the potential effects of autonomous adaptation, which would tend to improve yields. Thus, for simplicity we can consider that these potential positive and negative biases would roughly cancel each other and the estimates of yield changes are a reasonable first-order estimate.